UK Prime Minister's Trade Envoy Richard Graham MP led the biggest trade delegation to the Philippines. 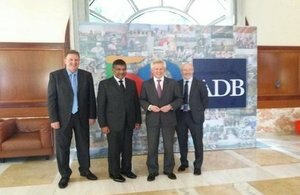 In a show of confidence in the Philippines and the Southeast Asian region, a trade delegation of 30 British companies visited Manila last week to explore business opportunities around projects funded by the Asian Development Bank (ADB) and other donor agencies. The organisations joining the trade mission represented British capabilities across the sectors of transport, water, urban development, education and skills, and financial and professional services. In addition to participating in the ADB’s Business Opportunities Fair, the UK companies also met with Philippine government agencies and private sector players to explore partnership opportunities. We believe in the growth and the further potential of the region, and the Philippines is very much at the centre of that. The economy continues to grow and the prospects remain bright. We recognise that there is still much work to be done to reduce inequality and make growth more inclusive. But while the needs are significant, there are also many partners including the UK who want to contribute to the fulfilment of the Philippines’ development agenda. Following the release of the Philippine Development Plan 2017 to 2022, among the priority areas identified are infrastructure and education which are key sectors of interest for the UK. British companies are interested in opportunities that will arise from the government’s plans to increase infrastructure spend, as well as reforms being implemented with regard to K-12 and increasing the quality of higher and technical education. On infrastructure, the UK has much to offer throughout the project life cycle, from conceptualisation and development, to construction and delivery, operation and maintenance, and PPP. Much expertise lies in advisory, engineering and design, procurement, and project management among others as well as the provision of technology, supply chain requirements and financing via UK Export Finance. Top infrastructure firms such as Arup, Atkins, and Biwater are already engaged in the Philippines and are looking to do more. On education, the UK is home to 4 of the world’s 2016 top 10 universities, has more triple-accredited business schools than any other country in the world and the most popular K-12 curriculum globally. By working with British organisations to provide training and resources, the UK is also leading the way in helping other countries develop excellence in their own education systems. Major institutions such as University of Nottingham, Cambridge International Examinations, and City and Guilds were part of the delegation and were keen to add value through their expertise in higher and professional education, curriculum assessment, and delivery of internationally recognised qualifications. The trade mission was led by UK Prime Minister’s Trade Envoy to the Philippines and ASEAN, Richard Graham MP, and was the biggest UK business delegation to visit the country in recent years. Manila was the first of 4 cities visited by the delegation in South East Asia. Mr Graham capped his visit by meeting with key business leaders in Iloilo. Senator Frank Drilon gave him a tour of the rapidly developing city and showed him some of the projects the senator initiated.